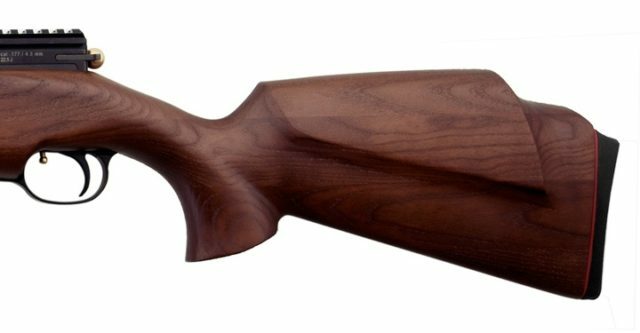 All ZBROIA rifles are available to order. Full spares & back up are available if something were to happen to your rifle. The rifles come with a FULL 2 YEAR manufacture guarantee. Model “Hortitsia” has been made by the ZBROIA Company since October 2015 in Kharkov, Ukraine. This PCP Pre-charged air gun is supplied in classic variant with Monte-Carlo style stock. 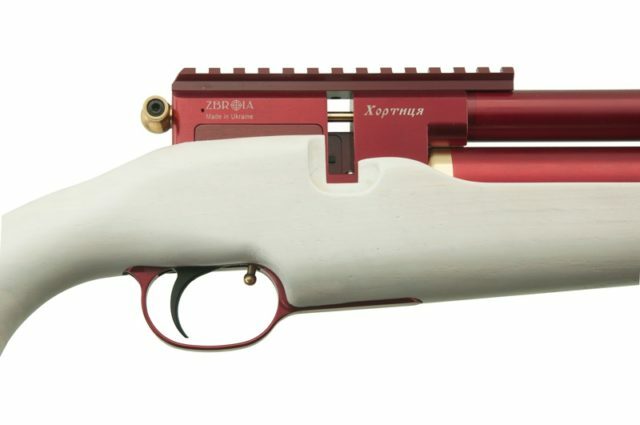 The main design criteria of this air gun were Accuracy, Quality, Reliability and Ergonomics. The air gun is made in either caliber 4,5 and 5,5 mm (.177’ & .22’). Also there are two standard barrels and air reservoir options: 330 mm / 180 ml and 450 mm / 220 ml. Weight of air gun is accordingly – 3,0 and 3,1 kg, length – 890 and 1010 mm. Steel barrels are made by Zbroia, and have 12 grooves. The barrel mounted “floating”, and has an integrated barrel shroud for very effective silencing. Manufacture is kept to strict tolerances to keep shot scattering at a distance 30 meter to less than 20 mm. A convenient quick fill probe port is revealed by unscrewing the cap of the manometer. Accessories include two filling adapters for filling the air cylinder – a quick fill probe and and adapter for filling cylinder when removed via the valve. A distinctive feature of reservoir is a built-in high accuracy reducer ( REGULATOR ), which allows shot velocity with around only 1 % variation and provides optimal consumption of compressed air. That is why fully filled reservoir is enough for more than 160 shots. The reservoir is removable, and can be unscrewed from the action. Scope Mounting uses a 160 mm Piccattini rail which is securely attached to the action, allowing convenient mounting of any optics. The adjustable trigger is made from high strength steel. The trigger unit is a detachable module. The trigger safety protects from accidental shots, with the safety lever located near of trigger. The weight of trigger and trigger travel is fully adjustable. For making adjustments you need to remove two screws, and take trigger unit. Reliability of air gun mechanism is assured by using only quality materials from the best European manufactures of spring, rings, manometer. Metal material items are sourced from Austria. And finally, the “Hortitsia” is produced in a choice of colours. The action can be provide in Black or Red, and three wood colours – wood, black and white are available.